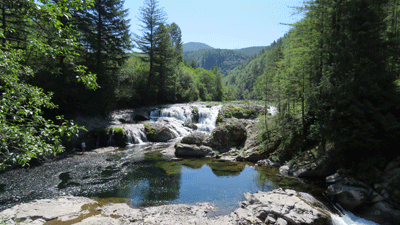 But first a quick run to Dougan Falls. We took a run up a nearby tributary of the Columbia River called the Washougal River. The road follows the winding creek for about 20 miles before it turns to dirt at Dougan Falls. The reason for this run was to check out the route for the ride that I was supposed to lead after the July club meeting. As it turned out the meeting was canceled and I never led it. My route turned back here until we reached a side road that led south to the Columbia River. Because we had some shopping to do also we took Kathy’s baby for this ride. We put the top down and it was almost as good as taking the bike. 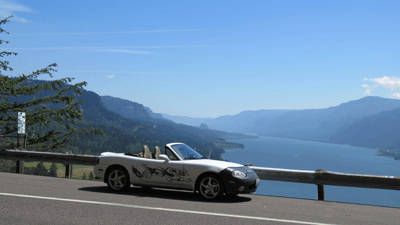 Here we are parked in a lookout above the Columbia River with the Columbia River Gorge in the background. Oregon is on the right, Washington on the left. The Columbia River is unusual in that it cuts through the mountain range rather than run alongside it. The mountains are younger than the river and as they rose the river was able to cut through them. It didn’t matter that the ride was canceled, we had a good time. Now for the End of the Oregon Trail Ride. 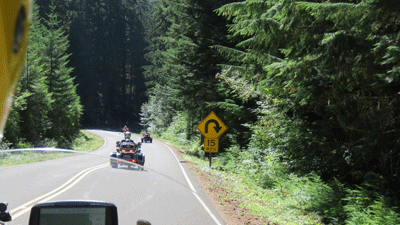 It is sponsored by the Gold Wing Road Riders OR-I chapter in Oregon city, Oregon. 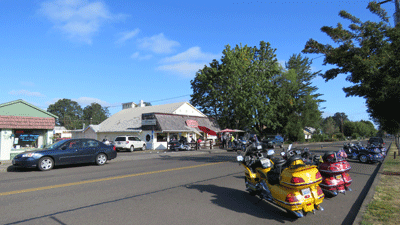 We rode to the starting point at a cafe and met up with friends from our chapters in Washington. The route headed into the foothills of the mountains and had some sharp curves in it. It was a well planned route. 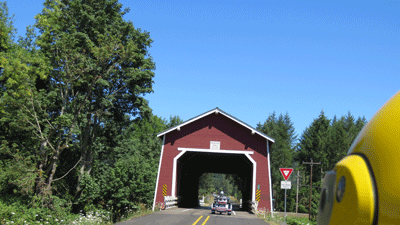 After the hills we wound our way through farm country and crossed a covered bridge. This ride was a true “poker run”. The scoring was done by picking a card at each checkpoint and the rider with the best poker hand was the winner. That was not either Kathy or I. 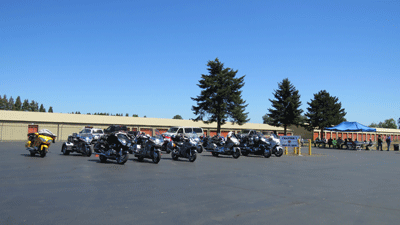 The ending ceremonies were at a Honda dealer where we had plenty of room for parking. More than enough for a larger crowd, which I’m sure the chapter was hoping for. The turnout was disappointing but the ride was excellent and the weather was great. Our next adventure will be again riding security for the runners of the Hood to Coast relay race at the end of August.